Although it was required reading for writing the new film “Men Go to Battle,” Kate Lyn Sheil was still debating the ethical quandary of reading the diary of a young woman named Sally Wagner even 150 years later. “Yeah, there’s got to be a statute of limitations on embarrassment,” Sheil concurs, still with a slight hint of concern, just enough in fact that you think that’s why “Men Go to Battle” turned out to be so special. Even if one can’t quite put their finger on it while watching it, you know there’s something different about Treitz and Sheil’s felicitous treatment of the tale of two brothers who become separated at the start of the Civil War in Kentucky. There’s an authenticity that can’t be denied, but it isn’t restricted to Jacob Heustis’ production design or the period-specific costumes; rather, it’s the emotional truthfulness that the two were able to suss out from the documents they could fine in Treitz’s family archives and others that lived around his family’s land in the Bluegrass State. The past truly comes alive in “Men Go to Battle,” which is at turns contemplative and spry, mournful and full of possibility, and slyly amusing throughout. David Maloney and Tim Morton star as Henry and Francis Mellon, who have differing ideas about what to do with the family’s 200 acres in Small’s Corner and go their separate ways after Henry embarrasses himself at a party, sending the two down very disparate roads in 1861. Thanks to the production’s clever move to enlist the help of a nearby reenactment for its major setpieces, there’s never a question about the film’s scope, even if it’s at odds for frequent festivalgoers with seeing such familiar faces from the indie world as Lindsay Burdge and “Western” director Turner Ross pop up along the way. Yet “Men Go to Battle” never loses sight of the smaller stories that ultimately make it such a rich experience – the restlessness of small town life that can be seen in the eyes of Betsy Small (Rachel Korine), who intrigues both Mellon boys, the camaraderie of the regiments when there’s nothing but loneliness back home, and the circular nature of family ties. Shortly after the film debuted at the Tribeca Film Festival, Sheil and Treitz spoke of how they brought the naturalism of the contemporary-set films that each have worked on to a type of film known for its grandiosity, “casually” capturing history and making something that can’t be recreated. Kate Lyn Sheil: The whole thing began with a family story of Zach’s. Zach is from Kentucky and there are these apocryphal stories that circulate around his family about his grandmother’s great grandmother whose family owned this general store and had this two-story house. Because it was two stories and had a piano, people would come from miles around to see it. We had heard the stories and we were curious what was true and what had been exaggerated over the years, so we started doing all of this research in these historical archives in Kentucky. Simultaneously, we wanted to write a movie for Tim Morton and David Maloney, who are the stars of “Men Go To Battle.” They’re old friends of Zach’s and also old friends of one another and they have similar cadences and senses of humor and both have these deep, booming voices and we wanted to see them play brothers. Zachary Treitz: They’re just brothers, basically, except for the whole genetic thing. We’re all from Louisville and we thought being able to tap into what I know of their relationship and draw on things from our own lives and insert that all into this blender and extract and exaggerate things from their personalities would be compelling for this story that had nothing to do with their lives. We knew that there are parts of their characters that could play really well and that they would combine this mutant baby and that the mutant baby would be something that we had never seen before and hopefully nobody else had seen before. That was important to make it new. Was the weight of history something to contend with as far as telling the story? Kate Lyn Sheil: What was helpful for that was reading all of these firsthand accounts of the time and the way we wanted to approach history was … maybe I would use the word “casually.” We would read all of these diaries and letters and while these hugely important events were happening in American history, we would know from the date that the person was writing. They would maybe mention [the events] briefly, but most of the letter would be devoted to what they had for lunch or who came over to visit. That reminds me so much of my life now – things are happening but most of the time, I don’t tap into it. So how are you supposed to deal with history? It’s so overwhelming, and the only way that we knew how to do it was to stick to the details and be as historically accurate as possible in the small things that happen. Zachary Treitz: We just tried to make it as literal as possible. It was a shortcut for us to be able to rely on very specific things that we knew were happening between fall of 1861 and fall of 1862 and very specific places in Kentucky and around the characters. To be able to see the movie through the characters’ eyes, we had this unbelievable resource that most writers don’t have, which is what actually happened and as long as we kept things really accurate, it opened up so much for us to play against. We didn’t have the burden of having to come up with imaginative solutions to plot problems because it was all there, so then we could make characters that were much more lifelike. Kate Lyn Sheil: Right, we’d rely on the details in order to allow for randomness and spontaneity. If we created this framework that was completely inundated in actual detail that we could then, inside of that, give the story a little bit of room to breathe. In the research that you did, was there some specific letter or artifact that you found that was particularly illuminating for the story you wanted to tell? Kate Lyn Sheil: Crazy things are happening all the time. Zachary Treitz: A lot of girls, if they were writing diaries, they’re pretty well-educated and they’re 16 or 17 years old, writing about these huge events in their lives, like courting to get married, which are big events for a 17-year-old of any era, but certainly more than anything I experienced at that age. Like God, you’re having to deal with this constantly? Kate Lyn Sheil: Also, the tone with which that information is delivered is like [matter-of-factly], “Papa died yesterday. John came over for a visit.” You’re accustomed to dealing with so much that the way that you weigh things against one another – that was something that was very interesting to us. And keep in mind, also, this is the first year [of the Civil War], so nobody thinks that it’s going to last for very long. So much of what we read was like, “This will be over soon. This won’t last long.” That lack of foreknowledge was something that we very much wanted to have in the movie. [For instance] from Sally Wagner’s diaries, during the war that’s going on, she was always really excited that Union soldiers were coming by because they were cute. Zachary Treitz: I remember her calling people brass buttons and she brought this one guy brass buttons. Kate Lyn Sheil: That was the other thing. Kentucky was divided and it was neutral for quite a while, so not only was Zach from there, so that there was never a question that the story would take place there, but it’s also particularly interesting. Zachary Treitz: It’s just a tinderbox of problems. You get right in the middle of it in so many ways. There’s this immersion, which I understand was there from the writing stage, but you can see it in Brett Jutkiewicz’s camerawork as well. Why was it important to be so close to the action? Zachary Treitz: The main thing was that we wanted to feel like we were just dropping in and out of these people’s worlds, as if we were going over to our friend’s house and filming with them now. That there would be nothing special about it. No beauty or anything, just capturing what’s going on. Kate Lyn Sheil: Right. We wouldn’t exoticize anything that was period, so just because Jacob Heustis, our production designer spent a very, very, very long time finding the appropriate arm to come out from the fireplace, no special attention would be paid to any of the details. We wanted to shoot close and avoid anything sweeping. We really didn’t want that at all. Zachary Treitz: The cinematography specifically was designed to be really pragmatic and utilitarian for the story and the characters. Of course, Brett can’t help but just make it beautiful on top of that, which was a push-pull that I think you feel in the movie of things being a little bit unsettled, always evolving and trying to catch up to what’s going on on the screen. We would create this camerawork that would feel like anything could happen next and would really follow the action. It always just followed whatever was going on onscreen rather than the cinematography leading us to the next logical place. So did you feel like you were bringing a little bit of Kentucky to New York for the premiere? Zachary Treitz: A bunch of people drove up. It was awesome. Kate Lyn Sheil: So happy they came. So much of the crew is Kentucky people. Zachary Treitz: We had a really small crew and a really huge cast, so a lot of the crew is just a really tight-knit combination of New York and Kentucky people. We made the movie over the course of over a year, and then editing and writing on top of those things, so this process all culminating in the premiere in New York City was surreal for everyone. Kate Lyn Sheil: Pretty insane. Kentucky was represented. Zachary Treitz: The feeling every day on set was just constant terror and extreme discomfort. Kate Lyn Sheil: In a very real way, [there was the sense] this movie might fall apart tomorrow and here’s why. Zachary Treitz: Yeah, it just never made sense that it actually worked out. Nothing was ever meant to be a sure bet and most of the time, it seemed like everything was nearly impossible. We liked that idea at first, but then grew really tired of it within the first weekend. Kate Lyn Sheil: We found that idea to be highly romantic at first. Zachary Treitz: Then it just became a huge burden, but it’s the reason the movie’s special because nothing that we captured we could ever do again. We almost made a documentary about us making this movie. We wanted to document a specific time, not only this [story from] 150 years ago, but a specific time in our lives that would be impossible for us to make again. Rather than something that’s more theatrical where you’re rehearsing over and over, and trying to get this one set of actions right and to feel natural, we were just trying to capture the thing that couldn’t happen again. 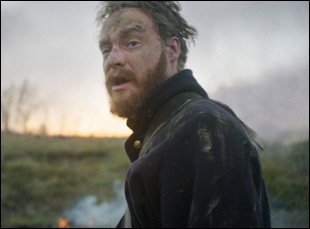 “Men Go to Battle” opens on July 8 in New York at the Anthology Film Archives, July 15 in Los Angeles at the Laemmle Royal and Winchester, Virginia at the Alamo Drafthouse and expands into limited release on July 22. A full list of theaters and dates is here. Interview: Steve Hoover and Danny Yourd on Becoming "Almost Holy"
Tribeca '15 Interview: Carleton Ranney on Chasing "Jackrabbit"